Following is a table of United States presidential elections in North Dakota, ordered by year. 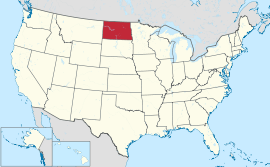 Since its admission to statehood in 1889, North Dakota has participated in every U.S. presidential election. 1892 Grover Cleveland 0 0 Benjamin Harrison 17,519 48.5 James B. Weaver 17,700 49.01 3 Electoral vote split three ways, with each candidate getting one electoral vote. ↑ James B. Weaver, 1892. ↑ For purposes of these lists, other national candidates are defined as those who won at least one electoral vote, or won at least ten percent of the vote in multiple states.